Move to the music with Angelina Ballerina and her friends as they explore the wonderful world of dance! Gracie loses herself to some disco grooves while Alice discovers the power of confidence through jazz! AZ hip-hops to a happy-birthday beat and Ms. Mimi takes her students on a modern dance journey. Angelina shows that friendship —like dance — is special, and best built one step at a time! Target age is 2 - 7 and it runs for 61 minutes. You can find games, videos, Angelina's Dance Studio and more at www.angelinaballerina.com and keep up with Angelina Ballerina on Facebook. Giveaway will end June 27th at midnight EST. I was given the above dvd to review from Lionsgate and HIT Entertainment. No other compensation was received. All opinions are my own. If you have previously won the above DVD you are not eligible.This promotion is in no way sponsored, endorsed or administered by, or associated with, Facebook. We hereby release Facebook of any liability. Winner(s) will be contacted by email 48 hours after the giveaway ends. If you have any additional questions - feel free to send us an email! my daughters love Angelina. thanks for the giveaway! my neice would love this! Thank you for this great giveaway- my Niece would love this! Thanks so much for the review and giveaway! We love Angelina! My daughter loves Angelina Ballerina! My daughters would be thrilled to have this! My little girl loves this show! Thank you! Daughter would love this! My daughter loves Angelina. Thank you for the giveaway! Thank you for the giveaway! I would like to try to win for my granddaughter. My daughter would love this! Thank you for the giveaway! 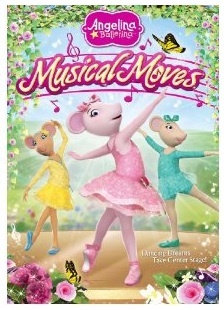 I know my daughter would love this DVD because she absolutely loves Angelina Ballernia. My daughter would love to have this DVD. Hope your no where near all the fires there in Utah! I love Angelina Ballerina! So does my niece. kristiedonelson(at)gmail(dot)com Thank you. This would be great for my daughter! Thanks for the great giveaway.